We just reported that Apple was working on fixing the iPad WiFi connection issue. We weren’t sure how Apple was going to release the fix. 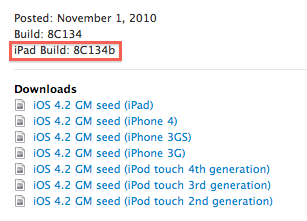 Apparently they have bundled it into a new iOS 4.2 Gold Master build (8C134b). This build will hopefully fix this horrible iPad WiFi issue that is plaguing iPad owners. If you have a membership to the iPhone Developers Program or the Enterprise Program, by all means head over to Apple’s iOS Dev Center and get your hands on this build. The Build number is 8C134b, and it’s a 551MB download. We need all the testers on this one, so we can get the public iOS 4.2 release all set to go. We will let you know how the updated build handles, hopefully everyones WiFi will be back to normal. I’m going to head over now and install the update. We will keep you updated, here at BlogsDNA.